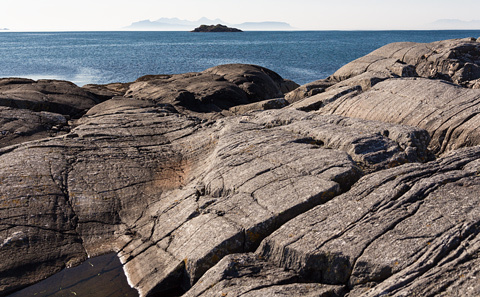 The end sequence of Valhalla Rising was filmed on the small rocky promontory to the south and west of Ardtoe looking across to the islands of Muck, Rhum, and Eigg. From the A861 just before Acharacle (if coming from the Lochailort direction) take the signposted B8044 to Kentra and keep going 3 3/4 miles until you reach Ardtoe. Ardtoe is an end of the road sort of place and has little scope for parking. There is however a small signposted parking 'field' which charged �50p to be put into an honesty box in 2012. From there turn left and go 100m back down the road to the camp site entrance which is the second turnoff on the right. Go through the campsite and head towards the sea where there is a gate which gives access to a small beach. Turn left and go along the back of the beach to the field. This can be wet and muddy in places. Don't do what I did and try to go around/over the rocks on the north side of the point, the initial route on the landward side of the point is crossed by several steep sided rocky gulleys almost from one side of it to the other. The route is very up and down over lots of rocks and is not the best approach unless you like a bit of a challenge. Instead head south across the field until you almost reach the gate on the far side. Around 15-20m before this look for signs of a faint path giving access through the trees on your right towards the point. Then it is a matter of trial and error to get towards the rocky tip of the point where the end scenes of the movie were filmed. There is still initially a bit of up and down but once you leave the trees it's mostly downhill over grass and bracken until you reach the rocks themselves. The filming location is where the left and right points of the small island in front line up with the two peaks of Askival and Hellival on Rhum in the distance. The middle point of the island lines up with the saddle between these peaks. They align so closely that it must either be symbolic of something in the film or may just be a nice bit of cinematography. There is also a small rock pool at this point which seems to always hold water. Visible in the bottom left of the still from the movie above and in my photo of the location below.